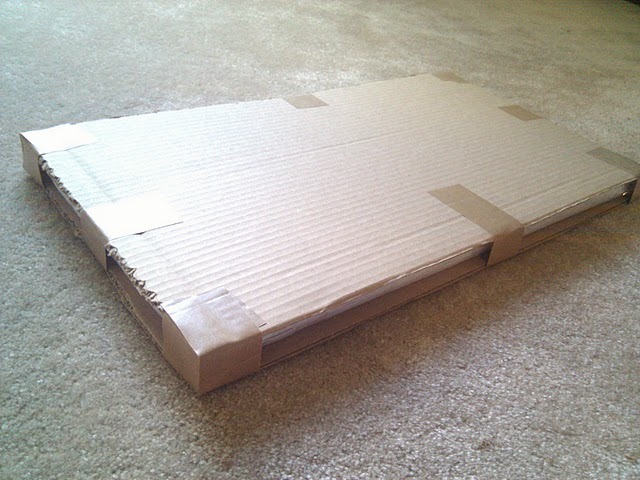 Here’s a step by step guide on how to ship a painting. These steps should ensure that your art will remain in perfect condition at its destination no matter how much it gets thrown around :) They’ve worked well for me so far – good luck! 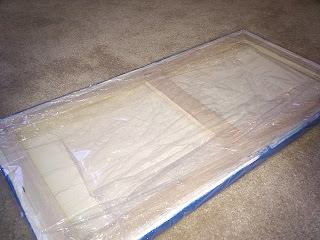 Step 1: Wrap the painting in clear plastic wrap. This protects the painting’s surface against any water that might get in. Where to get it: You can get a giant roll of plastic wrap from OfficeMax. 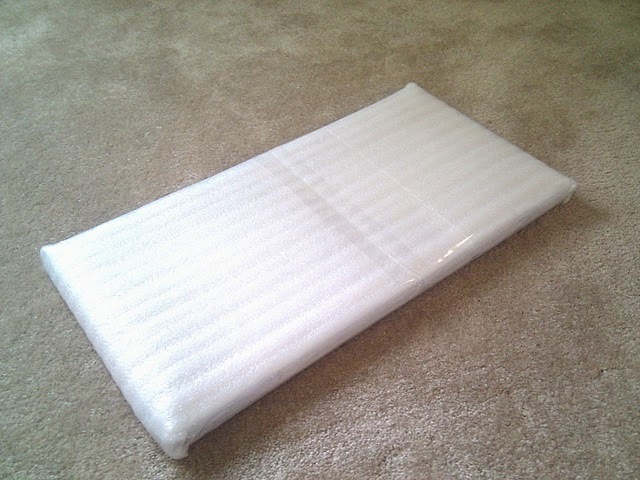 Step 2: Wrap the painting in foam wrap. This protects the canvas against dents. Where to get it: I get mine from Uhaul (just walk into any location). Step 3: Sandwich the painting between two layers of cardboard. This will protect against dropping, banging, etc. The cardboard should be slightly larger than the painting itself, so that if the corners are banged, the painting’s corners won’t be affected. Where to get it: Uline sells cardboard sheets in bulk, which I love because I’m lazy and if you get the right size they don’t need cutting (or they need very little cutting). Otherwise, you can reuse old cardboard boxes, but I recommend being picky about this and not using old beat-up cardboard boxes. It will look more professional and offer more protection, too. 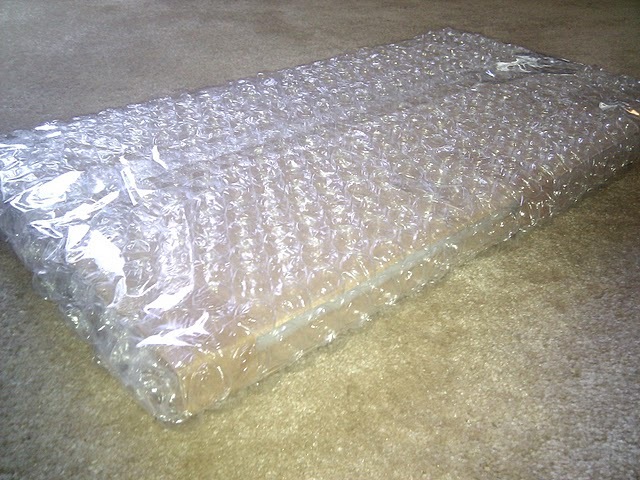 Step 4: Wrap the painting in bubble wrap. This will provide even tougher protection (including the painting’s corners) against dropping. Note: It is very important to sandwich the painting between cardboard before wrapping in bubble wrap. If you just wrap the painting in bubble wrap with nothing in between, then if the paint softens during shipping due to warm temperature, the bubble wrap will cause indents in your painting. Walmart: Best price for buying locally – even cheaper than the Uhaul store. Uline: Best bulk price, buy online. Step 5: Wrap the whole thing in brown paper. This will keep out dirt and makes for a much better presentation too! 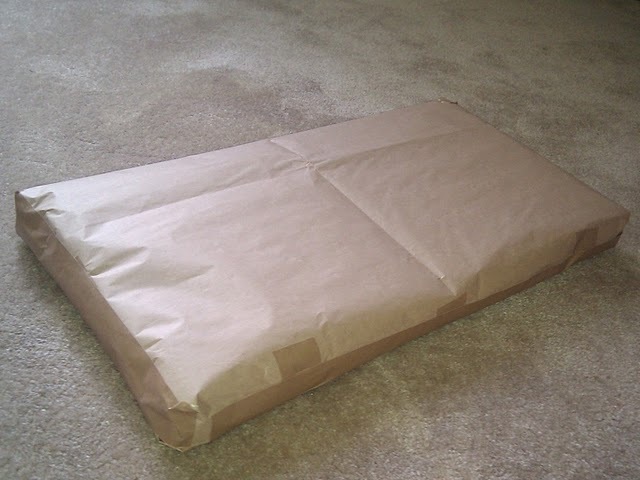 Where to get it: Uhaul sells really nice layered brown paper. They have a cheaper price online than in the store (and it comes as a huge roll instead of a small pack). Step 6: Box it up. Put it in a shipping box filled with foam popcorn pieces or paper filling, and it’s ready to ship! Walmart: You can get standard size boxes here for around $1. This is great if you’re doing a small amount of shipping and you wouldn’t get use out of buying boxes in bulk. Warning: Don’t buy boxes from the postal store – they are super expensive! Uline: Boxes in bulk in basically every size you can imagine! I usually go about 5-6″ bigger than the painting size. That allows a few inches for wrapping (bubble wrap, etc. ), and a few inches extra inside the box for popcorn, etc. They have a lot of different kinds of boxes on their website, so I’ve found the easiest way is to search by size. I have like 5 different favorite sizes for canvases, so I got like 5 different size boxes. I get popcorn from Uline as well. You can buy a huge bag of it (It’s really huge – like as big as me. It’s so big I keep it on my back porch) and then you don’t have to worry about getting more for a really long time! UPS – They seem to be the cheapest for very large boxes. I can go up to a 30″ painting (about a 36″ box) and it still costs only about $15 to ship. They have a UPS shipping calculator on their website. Select “Detailed Time and Cost. Make sure you select tomorrow or the next day for shipping date – otherwise, the price will be insanely high. The price varies depending on where the recipient is located. It usually takes a week to go from one side of the US to the other, like from California to Georgia, but it only takes like 2 days to ship to close locations, like from California to Nevada. USPS – They seem to be the cheapest for medium or small boxes. Add up the L, W, & H of your box. If it is 58″ or more, then it will be too expensive ($30+). However, if it is less than 58″, you will most likely see a lower price than UPS. For example, a box that is 12″x16″x16″ (12″+16″+16″ = 44″ which is less than 58″) only costs about $10 Priority Mail, whereas UPS Ground costs about $15. They have a USPS shipping calculator on their website. USPS Priority Mail is extremely quick. It will get there in 2-3 days for most locations. I’ve used FedEx a couple of times, just because their walk-in store was open until 11pm whereas UPS Store was closed, and I needed to get a package out asap. Their prices were about the same as UPS. For international shipping, I’ve only looked into shipping from the US to Europe and Canada. Europe was really expensive ($70+ to ship a painting) which was disappointing (if anyone finds any good solutions for shipping to Europe, let me know!). And Canada wasn’t too bad, it was $20, which is only $5 more than the usual price. For Christmas this year, I decided to paint some pictures for some of my family members. My mom is crazy about roosters, and her kitchen is yellow, blue, and white. 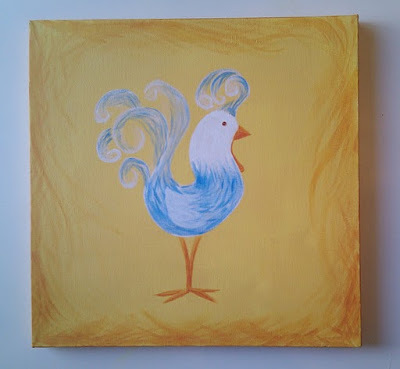 So I painted her a little blue and white rooster on a yellow background. I love the way this one came out! For my grandmother, well she’s really into apples. Her whole kitchen is decorated in apples! So I painted her a picture of a little bird sitting in an apple tree. 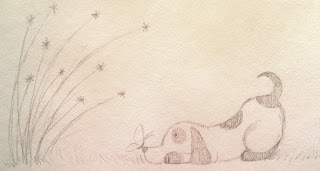 This is the start of my blog about painting. I was always into art growing up, and always chose art as all of my extracurricular classes – drawing, painting, ceramics, etc. But then once I finished school, I didn’t do much art after that. 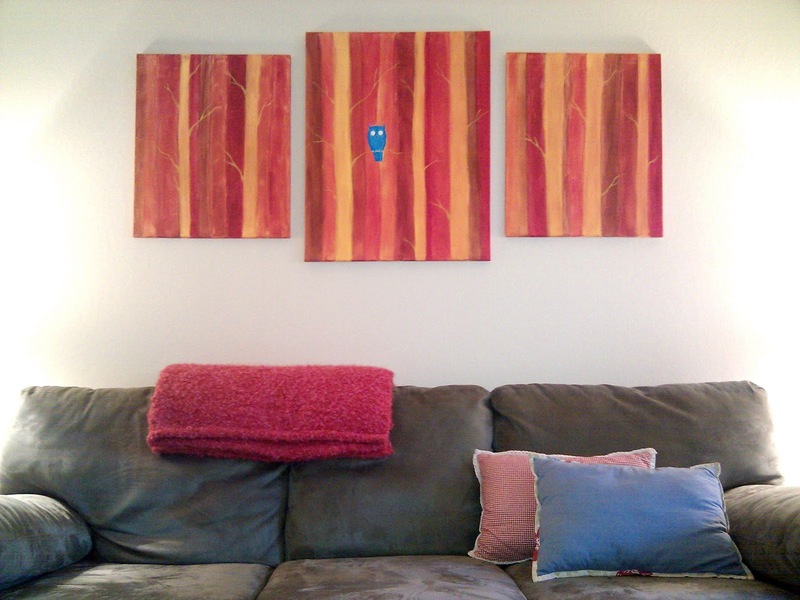 Then back in September I decided I wanted a painting for above my couch in my family room. I couldn’t find quite the right painting, with the exact colors I wanted. So I decided to just paint it myself! 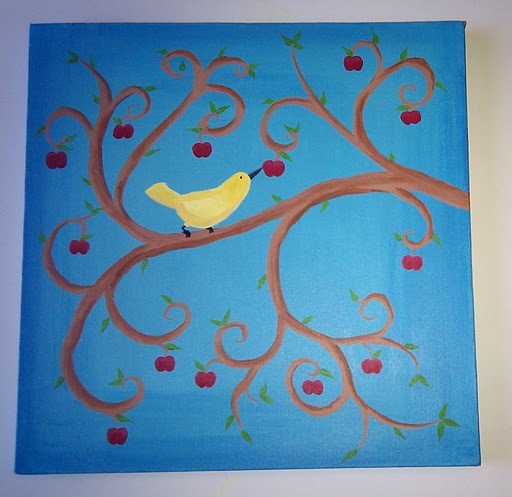 I had such a great time that I decided to start painting even more, and sell them online. I just thought it would be so cool to have my paintings up in other people’s houses! 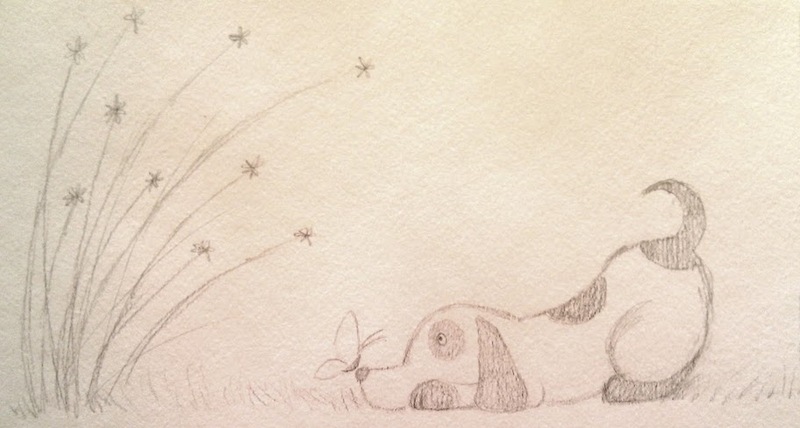 So I did – I set up a website on Etsy (heathercashart.etsy.com) and have had a few sales! It’s been pretty exciting.